SE 245 vs SE Singlecut? Discussion in 'Electric Instruments' started by starscream67, Mar 21, 2014. 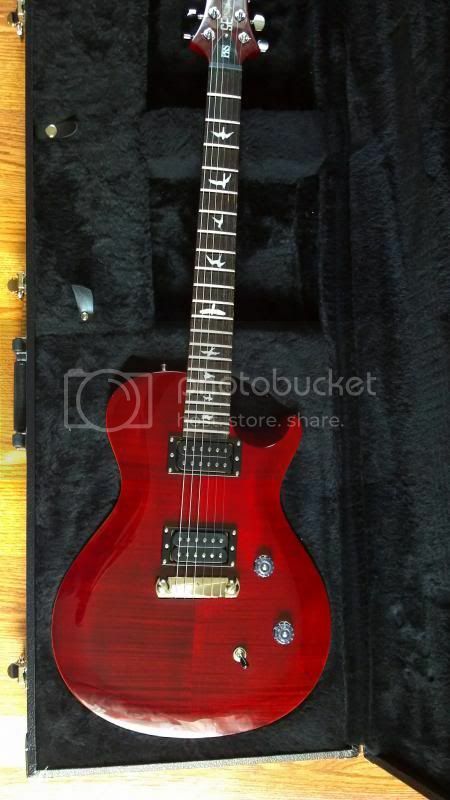 I have just ordered a PRS SE 245 - expecting delivery next week. I bought it with the intention of replacing an SE Singlecut (2011 with birds) and an Epiphone Les Paul. 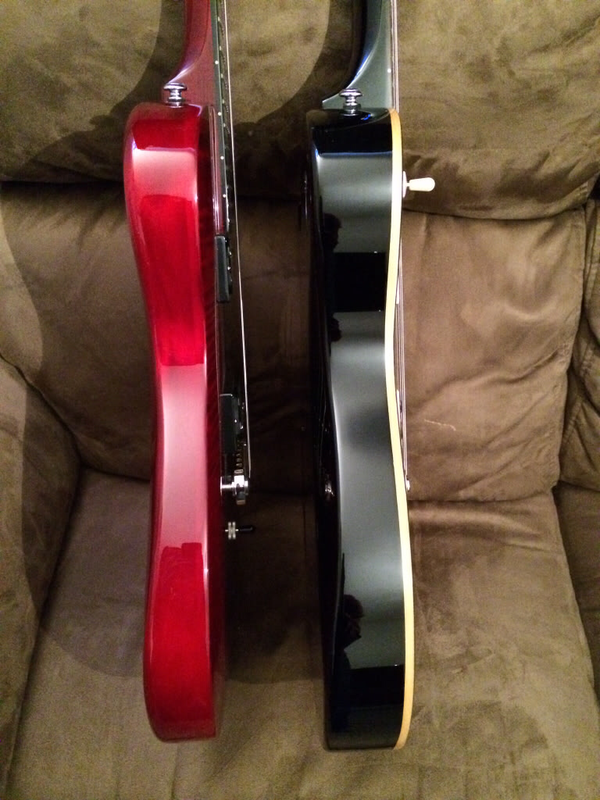 I know both SE's have different scale lengths, body thicknesses, pickups, volume/tones etc. 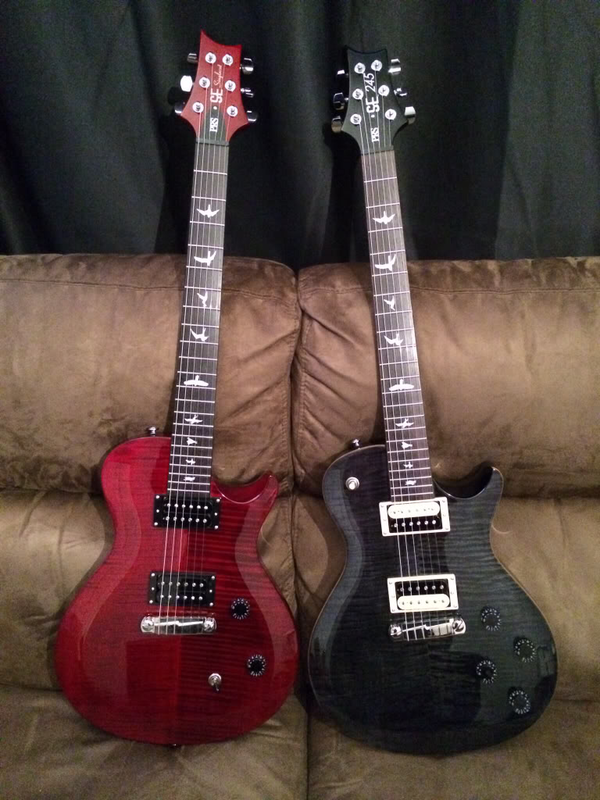 But do the differences warrant keeping 2 very similar PRS SE guitars in my collection? Thanks for any advice anyone can give, especially if you've also had this dilemma. Edit: I've haven't played a 245 as of yet so I'm buying blind from the interweb. I would say yes. I have both. I'm not willing to categorize the sound of either because I modify them until I'm happy. The singlecut does have a brighter, more brutish tone by and large. I'm working up the 245 to a more LP kind of sound. Don't forget to get a mahogany body with 2 P-90's. That's the shizzle. I've had the SESC and I now have the Bernie Marsden. There may be slight differences between the 245 and the Marsden but it's close enough to make me believe I can respond to the OP. I would not feel the need to keep the SESC. The 245 will do anything it will do IMO. Thanks for the replies guys. I'm expecting delivery today so I will report back with pics and my thoughts on the differences. I'd keep it. I've had a couple of the Epi LPs over the years and the SC is better in every way. Besides, it looks killer. I've always liked the 2 knob config more. But the SE 245 is hands down the winner for tone. The pickups sound more organic to my ears. Maybe keep the SESC and try a pickup swap. The stock pickups are great for heavy stuff, but not so much of expressive blues. Or just keep it for a different/lower tuning to keep your life interesting. Had a SE45 nice guitar and tone. But traded it for a SE SC. don`t care for the need fort 4 knobs. NOW the SC sports the USA drop in electronics w/ push pull pot for coil tap and a set of USA HFS/Vintage pups. thing is an animal now! and comfy. I like the 25" scale better than the 24.5. better for drop tuning as strings are not as floppy with out going up in gauge. the SE245 is a great guitar. I would take it over many USA LPs. just as a matter of curiosity, what kind of amps are you using? I use a nmv-single channel Marshall and having the 4 knobs on a Les Paul allows me far better control than the 2 knob setup on my SE Cu24- especially when playing a song live that requires clean and dirty tones. NOW the SC sports the USA drop in electronics w/ push pull pot for coil tap and a set of USA HFS/Vintage pups. thing is an animal now! I've heard others mention USA drop in electronics - what are these? Any one got a link so I can try to find them in the UK? This may very well be the answer I was looking for to keep my SE Singlecut. http://www.prsaccessories.com/collections/parts/products/3-way-push-pull-drop-in I did however need to replace the toggle in this kit with a Switch Craft toggle with longer thread barrel as the SE top is a lot thicker than the USA models. Was able to use the nice lamp shade USA knobs too! Thanks for the info leeasam. I've never modded a guitar before, so am quite apprehensive about ruining it. I was kinda curious how my Singlecut might sound with Seymour Duncan Whole Lotta Humbuckers - no idea if they'd be a good match or even fit. I guess I'll see what happens when I've broken the 245 in. I have the exact same se245! Beauty! Congrats and keep them all! I would keep that nice looking Singlecut SE. 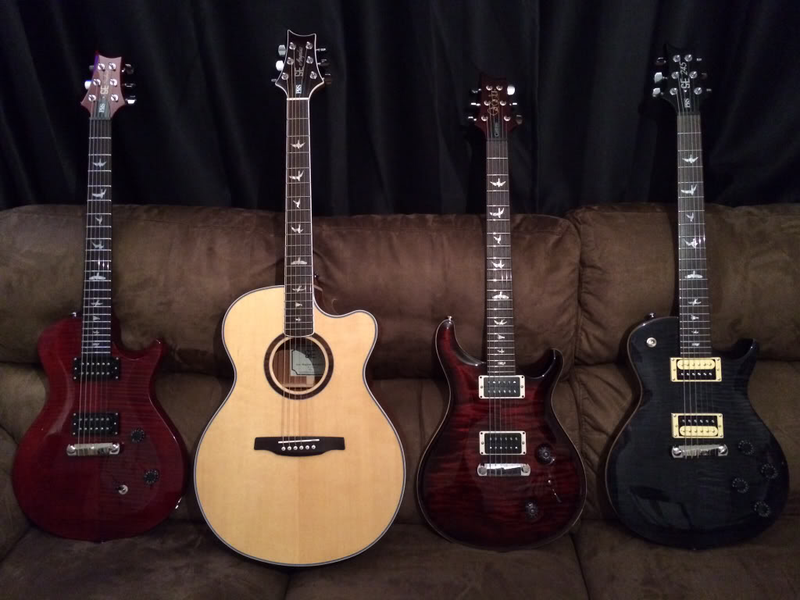 I have a couple nice Epiphones, but I like my PRS SE's better, in general. The stock pickups on the SE's sound better than the stock Epi ones. The nicest Epi I have is an LP Tribute; one of the original LP Tributes to Les Paul shortly after he died. It is a plain top cherry burst - plain maple cap for a top. It has all very nice hardware and electronics including Grover locking tuners, Switchcraft switch, Gibson USA 57 and 57 plus nickel covered pickups, high quality pots, etc. This came with a case and I think the new Plus Tributes also come with a case. Very economical for what you get. 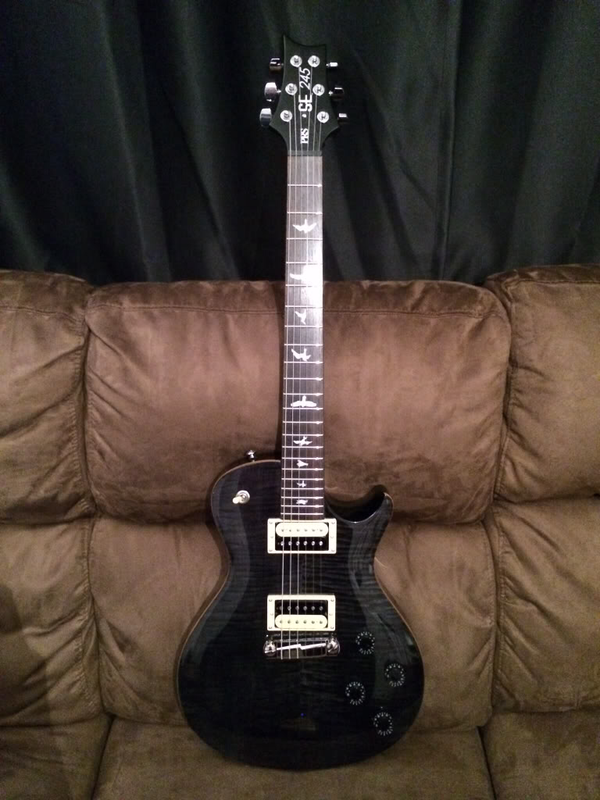 I also have a super nice Epi LP Custom in black that I put Gibson USA gold covered 490/498 pickups in - these are real nice Gibson pickups and this is a great guitar to play. I also have another interesting guitar. It is a Fender black Blacktop Stratocaster with a maple fretboard and black pickguard. I put black knurled barrel control knobs on it and Seymour Duncan black open coil JB bridge and Jazz neck pickups in it. It is blacked out except for the accent of the chrome trem and is a real sleeper guitar that sounds just amazing. I have been playing it tonight. It has brushed stainless Fender locking tuners as well. The guitar was about 500, the pickups were 200, the tuners were 70, and the knobs were about 20 - so it cost about 800 dollars to get it to its present state. That amount of money would buy you one of the new Gibson Les Pauls, brand new. The Gibsons tend to be a lot nicer than the Epi's. I paid that much for my brown faded Gibson LP Studio with a thick maple cap and Burstbucker Pro pickups stock. It is a great guitar, noticeably different in look and feel from the Epi's. It also has a great stock sound to it. I still think that the Singlecut, in its stock form is a great guitar and I like my Singlecut SE Tremolo guitar as much as the Epi's and the Gibson LP Studio, easily. I'd say if you get rid of the Singlecut that someday, not too far in the future, you will wish you had it back to modify or just plain have. Put some premium pickups of your choice in it and you will probably be very happy. If you could get some used USA PRS pickups for it you would probably be surprised at how good it sounds, or any premium pickups for that matter. Then your Singlecut will start to be personalized. The pickup swap is fun and easy to do. I have a pair of Marsdens, and have had two Singlecuts. Let me first say that I am not very sensitive to scale length, or number of frets for that matter. I'm more about neck shape & thickness than anything. Now it may be just me, but the Marsdens feel thicker than I recall the Singlecuts, but it has been a while. Tone-wise, the Marsden seems a bit darker than the SC was. The pickups also have a little different sound, but could be due to the body thickness - they seem a little less "hot", and not quite the same level of bright either. Thanks guys. I got rid of an SE Custom 22 with half moons for the SE Singlecut because it had birds. So I guess if were to keep all PRS' with birds, then logic says it should stay. Update: I sold the Epi and kept both the SE Singlecut & SE 245. Many thanks for the various opinions on this which cast enough doubt for me not to make the biggest mistake ever. For anyone else wondering, they do sound different enough to have both - I still prefer the Singlecut, but maybe the SE 245 would sound better through a different amp - I have a Vox Night Train.